Inji Hassan, 28, was born and grew up under Hosni Mubarak’s government. On January 25, she joined tens of thousands of protesters demanding the embattled leader’s resignation at Cairo’s Tahrir Square. 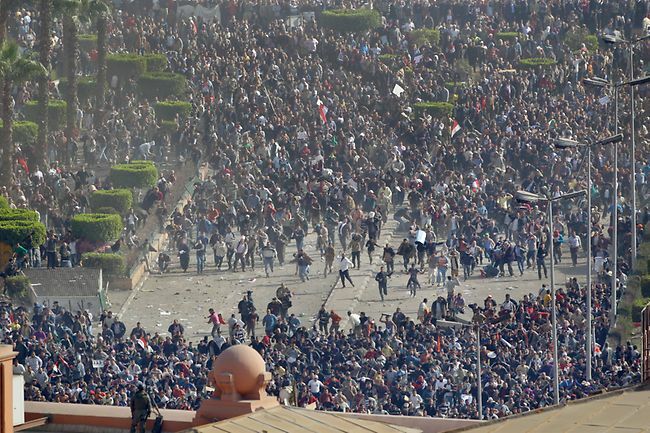 In this blog post, Inji writes about her experience in the first days of civil unrest and explains how the protests are an answer to many groups in Egypt. The full text first appeared in elPeriodico de Guatemala last week. Sampsonia Way translated the selections below. I heard the shouts of people from my balcony when the protesters walked to Tahrir Square. I wanted to join them but I was afraid: afraid of being harassed or attacked by the Police, afraid that the pain and humiliation would feed a hatred that would make me give up my efforts to improve the political situation without confrontation. The manipulation of the media and the shutdown of Twitter changed my position; I was so angry that I couldn’t stay at home. I headed to Tahrir Square. My father stayed at home worried, and my mother started to prepare food for the protesters with other neighbors. Everything started in Tunisia; the protests blew up at Sana, the tension grew in Tripoli and ended up on Cairo’s streets with a chorus of protest. Some people call it revolution, others uprising. I’m not sure that this is a revolution, but something huge and impressive is happening. In the middle of the acrid smell of tear gas, vinegar and cigarettes, for first time I smelled the smell of hope. 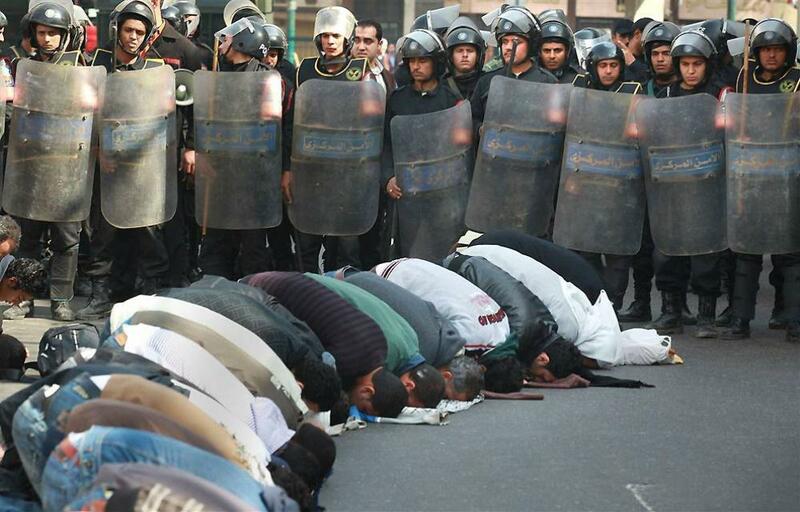 The protests started the same day as the National Day of the Armed Forces when the whole country was on vacation. At the beginning we thought that just a few people would join the protest and the day would end with a couple of detentions, as usual. But it was not like that, and we named it the National Day of Rage. Facebook and Twitter helped us to get ready. Little by little advice about the protest swamped the Internet. Through Facebook and Twitter I learned how to minimize damage from tear gas. You should, messages on Twitter advised, wet a handkerchief or a scarf with vinegar, and bring along an extra bottle to wet it again. I also learned that you could –and some people did- use a baseball mitt to catch the tear gas bombs and throw them back to the police. It was important to act fast and give the authorities a dose of their own medicine. 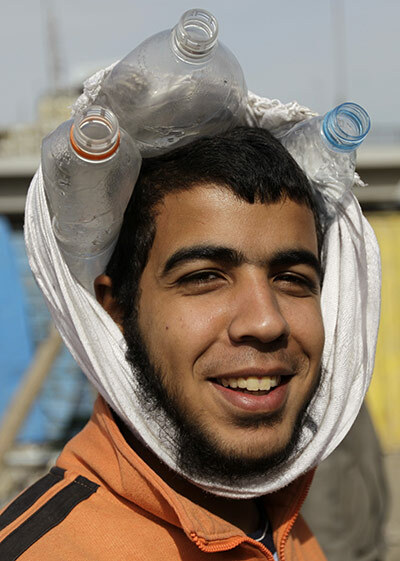 An anti-Mubarak protester improvises head protection. Maybe it was an eruption of rage, or a delayed reaction to the fraudulent elections—who knows? The truth is, we reacted…. Nobody knows what is going to happen tomorrow but something is going to change. The government can’t pretend that nothing is happening. The protests are an answer to those who maintain that the current government is better than any other option. The protests are also a good confirmation of everything I learned in my Political Science courses. Now I see a light. If we don’t see the change right now, we are going to see it in the future. We have demonstrated that we want and deserve a change. All political theories can fail at predicting the future, but one is firm: God is just. I can say that this is the first time that I have walked through Cairo streets without being sexually harassed. This is the first time that I have seen young people who don’t belong to environmental organizations picking up garbage from the street. 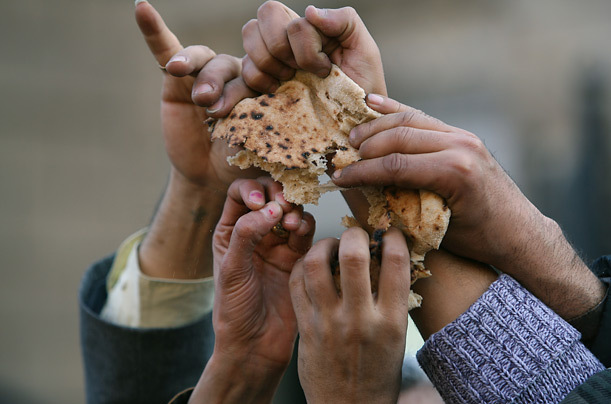 This is the first time I have seen a united people sharing food, water, and opinion, despite their differences. This is also an answer to those who think that the Muslim Brotherhood is the only governmental alternative. We didn’t see them at the protests and the only person I witnessed who chanted religious slogans was barely echoed by the crowd. These protests are also an answer to those who underestimate freedom of speech. I acknowledge I have been a severe critic of Twitter users because I believed they simply complained and didn’t act. Today, I apologize to them. Thanks to social media we went out to the streets and protested effectively. The comments and forums created a united feeling that we didn’t experience before. These protests are an answer to those who say we are not like Tunisia. I say: We are Tunisia and more. Although the Egyptian population is divided between a poor and suffering lower class and an indifferent elite, it is clear that we didn’t need a broad, educated middle class to make a change, as political theory states.